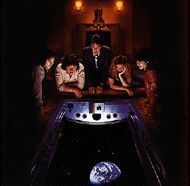 Paul McCartney "Back To The Egg"
Paul McCartney - all lead vocals except "Again And Again And Again", guitar, bass, keyboards, background vocals, Concertina squeeze box on "Million Miles"
Laurence Juber - guitars, background vocals on "To You"
Steve Holly - drums, percussion, background vocals on "To You"
Dierdre Margary - spoken voice on "Reception"
Tony Dorsey, Steve Howard, Thaddeus Richard, Howie Casey - brass overdub on "Arrow Through Me"
Black Dyke Mills Brass Band - brass overdub on "Winter Rose"
Harold Margary - spoken readings on "The Sport Of Kings" and "The Little Man"
Say You Don't Love Him, My Salamander. Why Do You Need Him? Oh No, Don't Answer, Oh No. I'm Getting Closer To Your Heart. When Will You See Me, My Salamander? L'm Getting Closer, My Salamander. Well When Will We Be There? Ah No, Don't Answer, Oh No. So bring all your friends, come on. We're open tonight, come one, come all. We're clearing back all the floors. Spin it on, don't stop. Take it back to the top. I wanna spin it on. Spin it on! Off to the flicks with the piddle in her nicks, to the fair with her hair in curlers. Their cousins didn't send their night in an aircraft hanger. That's why I wanna spin it on. Spin it on! Spin it on! That's why I wanna spin it on. Spin it on! Their cousins didn't spend their time on a pinball table. 'Cos I got whole lotta love for you. Spin it on! Spin it on! I wanna spin it on! I wanna spin it on! Spin it on! Don't Stop! Take it back to the top! 'Cos I got a whole lotta for you! I love. No, no, no, no. I love. You don't wanna be the one that's cool. You don't wanna be the little woman I love. I said good-bye to all my expectations the day you walked out of my life. Gimme a sign if you can somehow. Will I see you someday at my door? Love's a game I never win. You just wanna be on your own. Then things changed, so where did we go wrong? In the greener grass on the other side. In a village in Old Siam, sir, there's a lady who's lost her way. In an effort to find a man, sir, she found herself in the old UK. She waited 'round in Walthamstowe, she skated 'round in Scarborough. In a village in old east end, sir, she mea fellow who made her real. He met her dad at the wedding meal. In a letter from Old Siam, sir, came an awful tale of woe. She decided the only answer was to get off a pile of dough. When a relative told her man, sir, he directed her not to stay. In a village in Old Siam, sir, there's a lady who'se lost her way. Walthamstowe . . . Scarborough . . . If you'da started at nothing and counted the ze-e-ro. Would you still put me through what you put me through? If it happened to you. What if it happened to you? But you can't get a ride to his side of town? What if happened to you? Keep it out of my shoes. And if you're stepping on toes, keep it outta my nose. Well, it won't be as bad as it used to be. If it happened toyou. What if it happened to you? What if it happened to you, too? What if happens to you? Keep it out of my shoes. Well, what if happened to you? * repeat until fade: What if happened to you? You were the one, the one who would love me, after the ball. Nowhere was a freindly face to be found. There you were waiting to bring me 'round. How many million miles, day-oh? When I get up, up, up in the morning, whoa! Lord I know. When I look up, up, up in the morning, whoa! Lord I know. We may even have to cut and run for it. And it won't be the first time I've been caught. It's the game that matters. Brother, I am proud to know you. This is one of the greatest moments I have ever experienced. Here along with our little friend. As the whitest thing in our museum of recollection. And wash the face of our little brother here. I'm inspired with a new faith in mankind. A sure enough saint only one a halo to be transferred. Someone's got a home tonight. Someone's got a road tonight. Oo, you're gonna knock 'em dead. Someone's got a show tonight. Someone's doing rhyme, someone turn your mind. So glad to see you here. Carry on. Carry on. Oh, we're going up tonight. Well in time to make a flight. Engine nervously waiting for something to bite. You got to roll tonight. You got it better, and there's nothing to it. No no no no. So glad to see you here, so glad you could come. Yeah! So glad to see you here. Carry on. Carry on! "We're open tonight for fun". My baby says she knows how it goes but you're the one that really knows. Please play me baby's request. Mh-hm, play me baby's request. Please! Play me my baby's request -- one more time. Mighty river, give her all she gets. Daytime nightime suffering is all she gets. Let your love of you people show. Let your love of you people be. You are the river, I am the stream. Flow mighty river through me. Daytime nightime suffering is all she gets? Don't be stopped by insanity. Let your love for your neighbours show.